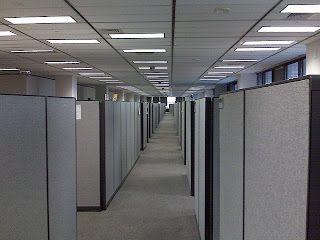 At my day job, we're going to what is called an "open-plan office." Otherwise known as densification or becoming LEAN. The goal of an open-plan office, says experts, is to encourage collaboration by ripping down the walls and letting everyone share space with their co-workers. It will encourage collaboration, they say, and for that reason approximately 70 percent of American employees now enjoy a wall-less office. The problem with an open-plan office is not all jobs require collaboration. Think of accountants and software developers. Sure, both jobs occasionally require teamwork, but there are simply some jobs that require someone to hunker down and get to work. Which is why the workplace is shifting toward home. Those who don't need to collaborate work from home, where there are numerous other distractions like annoying neighbors and garbage trucks. Plus, when you work from home, the guy down the street assumes you are free at 10 a.m. to help him haul mulch to his back yard. Either way, it seems to me that as unattractive and prison-like as picture number one is, maybe people need those walls. Because, more often than not, when co-workers are talking to their neighbors, they aren't collaborating at all. They're gossiping. What do you think? Do you have experience with an open-plan office? Does it work?